Vladimir Mayakovsky (1893 - 1930), one of Russia's most gifted writers and a prominent member of the avant-garde, is one of the most universally recognized characters in Russian history. Having taken his own life at the age of 36, he left behind a wealth of ground-breaking poems, prose, plays and art that continue to influence and inspire writers and artists to this day. Mayakovsky embodies the spirit of the Russian avant-garde - a creative individual who willingly sacrificed his means of self-expression to further the cause of the socialist revolution, and to give shape to a completely new Soviet culture. Redefining the artist's role in society, Mayakovsky pointed to the artist's ultimate responsibility to reshape and reconstruct the new socialist culture and society. Poems influenced by Pushkin and other traditionalists were cast aside and replaced with works employing revolutionary combinations of words and images, dedicated to espousing industrialization and the new Soviet system. Mayakovsky devoted himself to fulfilling the role of "worker-poet": setting quotas for himself and adhering to the same expectations set for factory workers and other laborers, Mayakovsky pushed himself to produce, construct and create. In the span of his career, Mayakovsky produced a wide range of poetic works: early works which display the poet's hyper-sensitivity and sentimentality, and offer some of the century's most ardent and emotional lyrics of love and introspection; and works devoid of all personal expression, written to inspire and applaud the Soviet masses. The Russian Futurists, dismissing all writing which had come before them, proclaimed their commitment to injecting a new spirit and enthusiasm into Russian culture and literature. Spouting futurist verse from sidewalks and street corners, and calling for the complete rejection of tradition, Mayakovsky, Burliuk and the other Futurists would roam through Moscow, wearing capes, costumes, wooden spoons poised ridiculously in their lapels, and images of airplanes and animals painted on their faces. In the years that followed, Mayakovsky pledged himself to the service of the revolution. Inspired by the new government's promises of better living standards and equal rights for all Soviet citizens, and its commitment to encouraging new forms and directions in art, Mayakovsky traded poems of emotion and personal experience for socialist slogans and propaganda pieces. 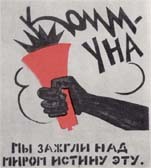 Urging other artists and authors to do the same, he set an example by devoting himself to designing propaganda posters for ROSTA (the Russian Telegraph Agency). One of the few times he would create his own images, these projects integrated words and pictures, offering grotesque caricatures of bankers and the bourgeoisie, and urging support for the Red Army in the civil war against the White Army. Despite his wide-spread popularity, an assortment of misfortunes occurred which pushed Mayakovsky into a deep depression; growing disfavor from the government, the extended suppression of self-expression, and the eventual loss of the love of Lili Brik are all factors attributed to the poet's decision to shoot himself on the evening of April 14,1930. In death, Mayakovsky is far from gone. Reversing a statement in which he recently had denounced the poet, Stalin proclaimed Mayakovsky a national hero. Today, monuments and statues of Mayakovsky stand tall in city squares throughout the former Soviet Union, and schools, universities and metro stations are named in his honor. His words live on in contemporary publications of his poems, and in productions of his plays. This profoundly charismatic and artistic persona still serves as a symbol of the spirit of the Russian avant-garde, and the poet's remarkable presence continues to shine through photographs and other images. These portraits by Rodchenko and other avant-garde artists, so charged by the power of Mayakovsky's passion and dynamism, offer an introduction and an invitation to further indulge in the fascinating realm of the Russian avant-garde.